In this paper we investigate the application of natural language processing tools to the multilingual proceedings of the European Parliament. This work is part of a study in which we explore (1) how subcorpora in different languages may lead to different conclusions about the political landscape, (2) how to determine what a potential language-related bias originates from, and (3) to what extent we can limit or even prevent an unwanted language-bias. Hollink, L, van Aggelen, A.E, & van Ossenbruggen, J.R. (2017). 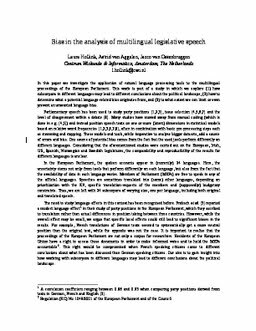 Bias in the analysis of multilingual legislative speech. In Proceedings of Digital Humanities Benelux Conference 2017.